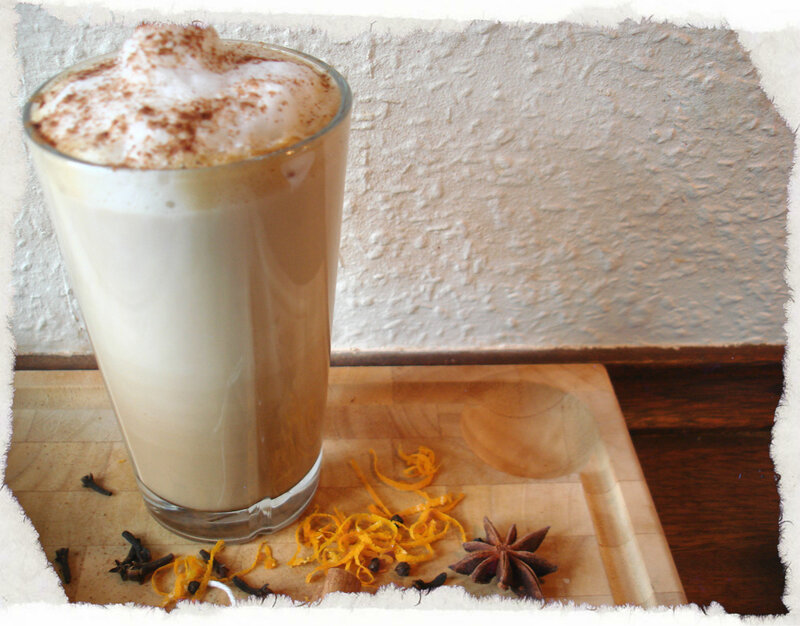 Whenever I go to a café I always choose one of two drinks – coffee latte or chai tea latte. 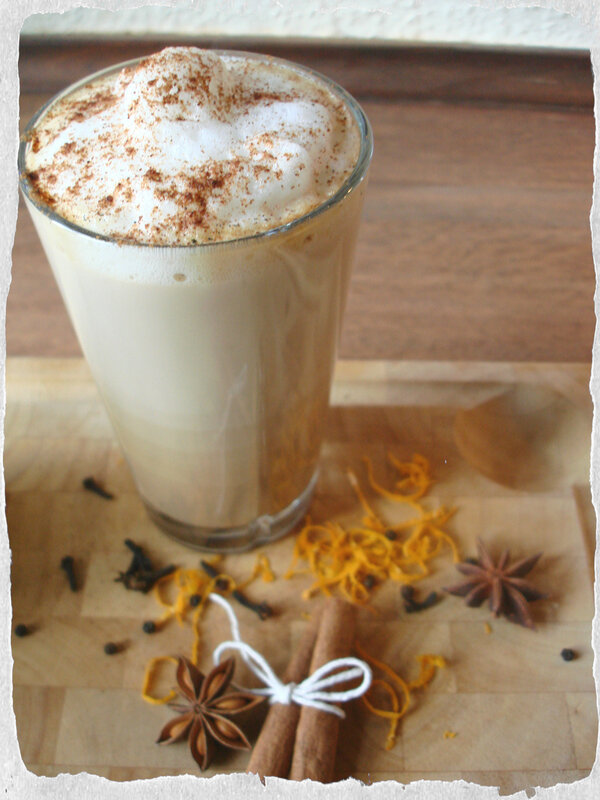 I love the sweet and spiced flavor of a good cup of chai latte. 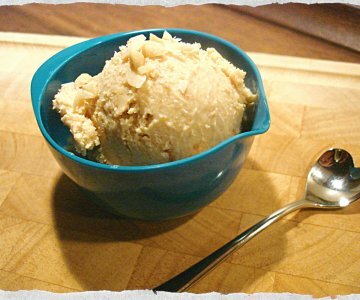 A few years back I tried to make a pot of homemade chai, but it didn’t turn out great; too weak and not enough flavor. 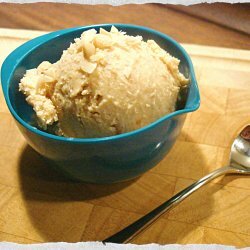 But now I found a great recipe for chai concentrate online, here and decided to give it a go again. And I’m so happy that I did. Because it turned out just right, full of chai spiced flavor. 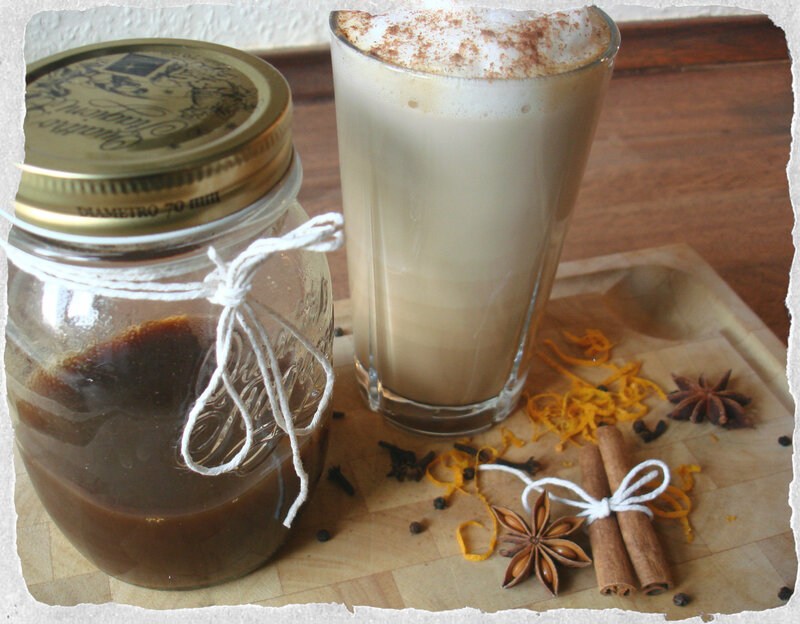 I made myself a glass of chai latte using the concentrate, and I am sitting here a very happy gal. Removing any tags on the teabags. Prepare the spices, vanilla bean and orange zest by laying them in your cheesecloth. Tie the cheesecloth pouch shut with a small piece of kitchen twine. If you leave the cinnamon sticks out, just tie them together with kitchen twine. Add the water and sugar to a medium sized saucepan and bring to a boil over a medium-high heat. Once boiling, reduce the heat to a simmer and put in the tea bags, cheesecloth pouch, pieces of ginger and cinnamon sticks. Simmer for 20 minutes. Remove the pan from the heat strain the concentrate through a sieve or just remove the tea bags, cheesecloth pouch, ginger and cinnamon sticks. At this point if you want a bit more sweetness you can add a tablespoon of honey, stir to dissolve. 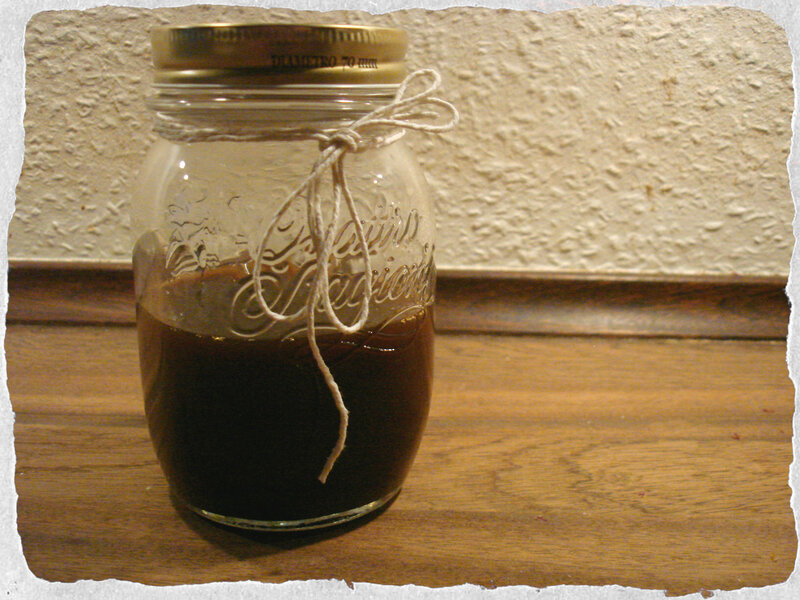 Allow the mixture to cool before pouring it into an airtight jar or container. To serve, mix 1 part concentrate with 1 part milk of your choice. Heat for a warm beverage or serve over ice for a cold drink. I poured 1 part concentrate in a tall glass and warmed it in the microwave for a minute. Meanwhile I heated a part of milk in a pot on the stove. I have a small electric whisk, which I used to froth the milk a bit. And then I just poured the milk in the glass with chai. 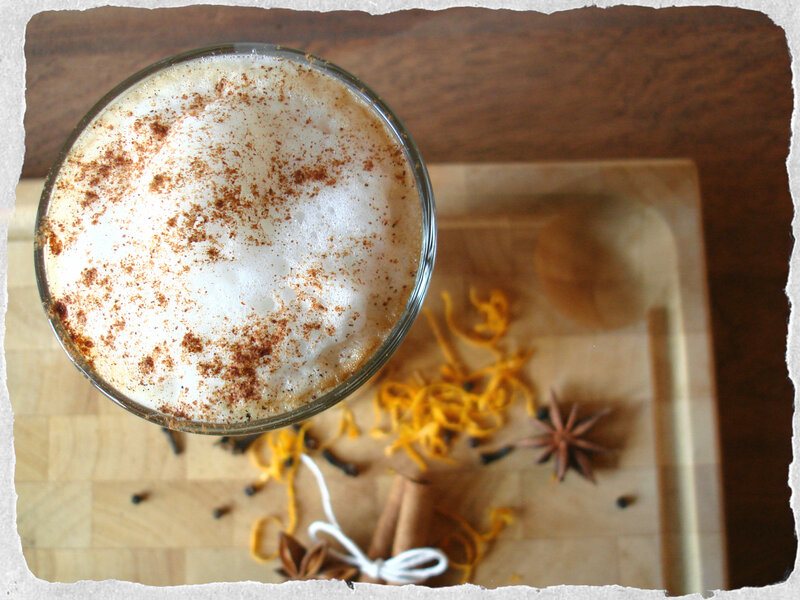 And there you go, a wonderful homemade Chai Latte.